Having use of sought-after equipment has enable leading rugby league club Batley Bulldogs to roll out fun and exciting active sessions for the Kirklees community to enjoy. 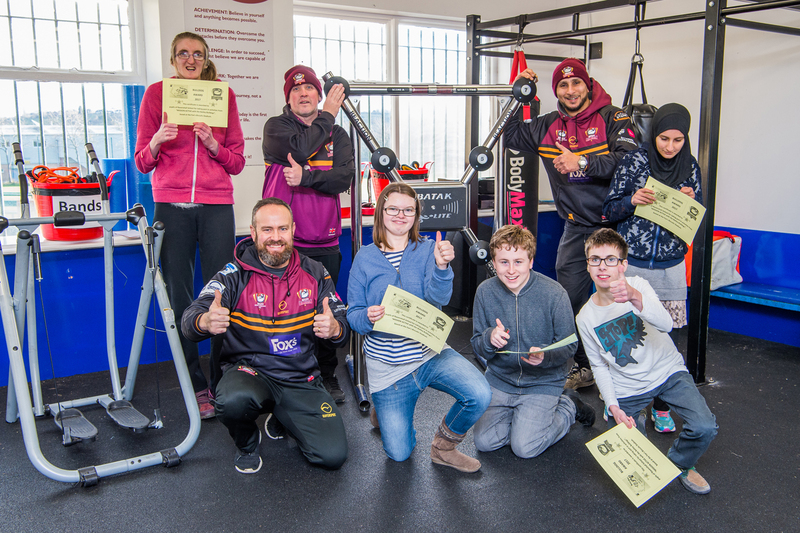 The partnership between us and the Kingstone Press Championship side’s Community team has seen them roll out its ‘Mission Active’ project – a programme aimed at getting all ages active in the community – from its community gym at the club’s Heritage Road stadium. Using equipment from our online platform such as two BATAK walls, a balance rail, trampolines, three spinning bikes, speed jumps and a variety of kits to hold cricket, boxing, badminton and hockey sessions, the team have already held active sessions for school pupils, the elderly, rugby teams and young people with complex needs including Dewsbury’s Ravenshall School. And Jon Humpleby, Batley Bulldogs’ Community Manager, said that with such equipment, they have been able to help the Kirklees community even more in their pursuit of getting people of all ages active. “As well as helping to grow our community gym sessions, Comoodle’s help has also meant we’ve been able to visit schools and take our sessions into the community which has been fantastic,” said Jon. “The fact that we are custodians on the Comoodle platform and we’re able to use the equipment for free, is fantastic. We couldn’t afford two BATAK walls without Comoodle’s help so it’s allowed us to do things that we wouldn’t have been able to do otherwise. “It’s really important we get involved in the community and that we are seen to be a focus group where people can come along, get together and do fun activities. Batley Bulldogs is one of several groups to have used our online platform and help our quest to create a ‘sharing revolution’ in Kirklees. Speaking about getting more businesses and groups on-board, Jon added: “We need to keep spreading the word about Comoodle and the amazing things we’ve been able to borrow, use and tell others about the sessions we can offer.